Launches Mario high into the air. 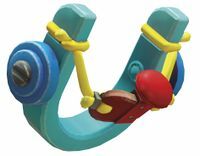 Slingshots are objects that appear in Super Mario Odyssey. They are light blue, U-shaped, and are seen slightly suspended in the air above the ground. When Mario throws Cappy at a Slingshot, he will be launched into the air onto platforms or areas that are normally unreachable. They are also used to quickly get back to a previous area of a kingdom. This page was last edited on December 3, 2017, at 14:09.